Beforehand, whenever I mentioned my upcoming journey to Skye to the denizens of Scotland, I was met with the same response. A midge, for the uninitiated, is something like a biting gnat. I once asked how one could tell the difference between a midge and a gnat, and was told that you didn’t really know until they started biting. 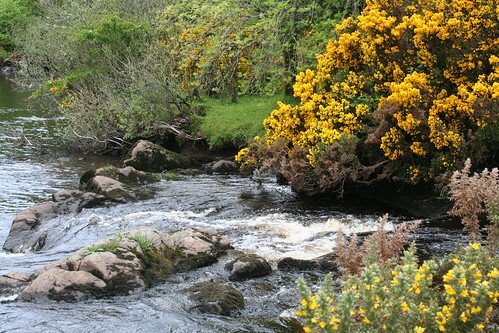 This warning, about the swarms of midges from the black lagoons of doom that will band together to carry off your dog, your children, and your spouse before turning their attention–and pinchers–to feast upon your tender flesh, did not excite me for the upcoming festival (which was reported to include story walks). 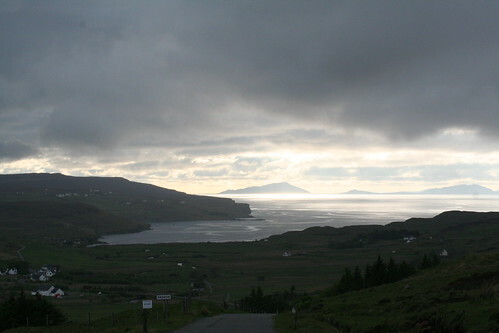 Skye is has sort of austere loveliness. Its seemingly barren landscape has a mythic quality about it that was an ideal backdrop for the tales–both semi-historical and legend–that would be told over the three day event. 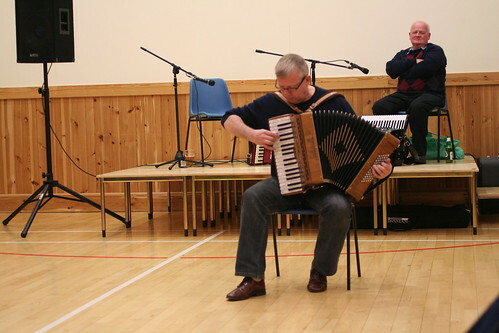 The East and West Storytelling festival kicked off on Friday night with a ceilidh. 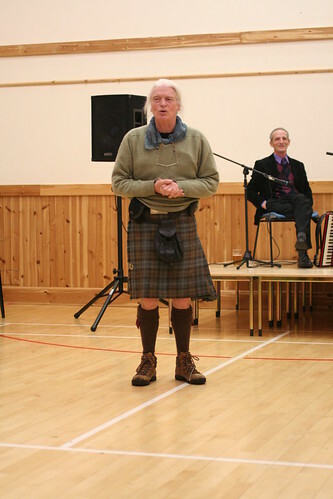 George, our kilted and extremely knowledgeable host, gleefully ambushed familiar audience members, dragging them before the gathering to sing a song or spin a story. And there was dancing, including a terribly botched–but no less enjoyable–rendition of Strip the Willow. Saturday the events began in earnest. 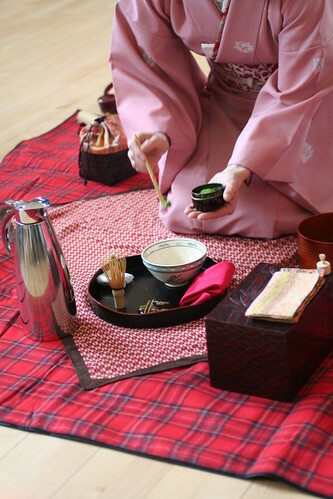 First we were treated to a tea ceremony, which was followed by workshops. 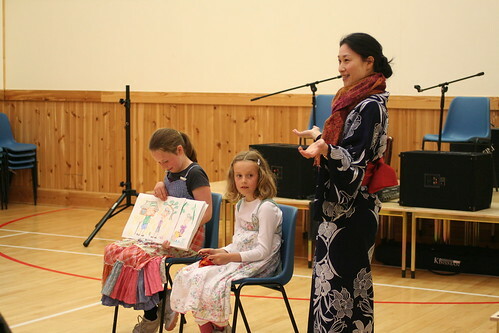 I attended a session discussing the Ainu people of Japan and their connection to the people of Skye. The Ainu are potentially a lost Celtic tribe, migrated across Russia to Japan over the ages. George told us that among the Ainu, there were still those with the red hair or blue eyes of the Celts. 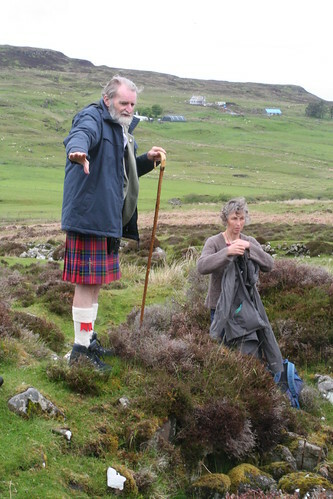 We learned at length of the Dr. Neil Gordon Munro, a Scottish champion of the Ainu. He lived among them for many years, producing a work that showcased Ainu culture as something unique and worthy of preservation. Saturday afternoon held a story walk down “the old road”. We strapped on our wellies or gators, pulled on our rain jackets, and followed fearless leader George out into the Skye drizzle. Past sheep and heather, over mud and streams, we learned about both the real history of Glendale (crofting and harsh landlords) and the more legendary history of Skye, such as how a couple of the mountains came to be flat on top (giants and little people). 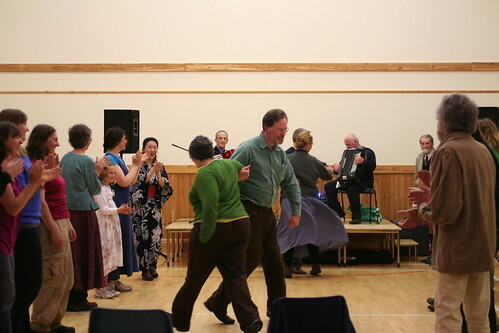 The second night’s ceilidh was, if possible, more awesome than the first. Among other things, we were treated to Rose’s delightful skeleton dance. 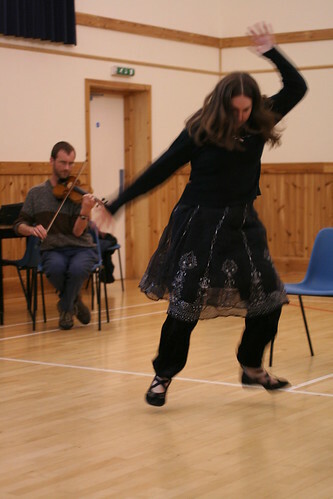 The second night’s ceilidh lasted until nearly midnight, and then moved to George’s house until dawn! On our final day in Skye, George piled us all in a mini-bus and took us off to see the place where the first king of Scotland to be converted to Christianity was baptized, the corner of a small, lush island that had once housed a monastery. And with a final lunch and delightful scones, our time at the Glendale gathering had come to an end. With no midge scars to show, and new stories to share, it seemed to me that the Skye Storytelling Festival was a smashing success.